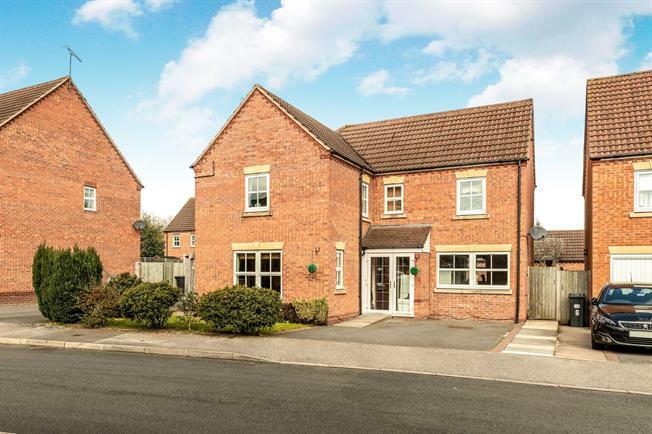 4 Bedroom Detached House For Sale in Warwick for Guide Price £450,000. With a modern open plan family kitchen dining room this spacious and thoughtfully improved four bedroom detached home has been updated and reconfigured to provide a great family home offering two reception rooms and briefly comprises; entrance porch, entrance hallway, WC, living room, large playroom/reception room two, modern open plan kitchen dining room, utility room, three double bedrooms with en-suite to the master, a further large single bedroom, driveway parking for two vehicles and a rear garden. Double glazed uPVC door opening into the entrance hallway. With under stairs storage the entrance hall has wood effect laminate flooring, radiator and ceiling light. Low level WC and pedestal sink with tiled splashbacks. Double glazed uPVC window with patterned glass. Tiled flooring, radiator and ceiling light. Dual aspect double glazed uPVC windows. Wood effect laminate flooring. Feature electric fireplace with stone effect mantle. Radiator and ceiling light. Recently renovated with a range of wall and base units with soft closing draws and stylish grey wooden work surfaces with integrated one and a half bowl sink with mixer tap over and drainer. Integrated five ring Rangemaster hob with Rangemaster extractor overhead, Smeg grill, oven, microwave, dishwasher and fridge freezer. Tiled flooring with under floor heating. Double glazed uPVC window facing the rear overlooking the garden. The dining area has double glazed uPVC French doors opening onto the garden. Ceiling light. A range of fitted wall and base units with stylish grey wood work surfaces over. Inset sink with mixer tap and drainer. Space for washing machine and dryer. Integrated wine fridge. Tiled flooring with under floor heating. Double glazed side door leading out to the garden. Radiator and ceiling light. Converted in 2011 a former garage is now an additional reception room currently used as a playroom with dual aspect double glazed uPVC windows facing the front and rear of the property. Wood effect laminate flooring , radiator and ceiling light. Spacious landing with large airing cupboard with shelving, loft access, double glazed uPVC window, radiator and ceiling light. Double bedroom with built in wardrobes. Triple aspect double glazed uPVC windows. Radiator and feature fan ceiling light. Low level WC, pedestal sink and single enclosed shower. Tiled flooring and part tiled walls. Double glazed uPVC window with patterned glass. Radiator, extractor fan and spotlights. Double bedroom with double glazed uPVC window overlooking the garden. Radiator and ceiling light. White three piece suite comprising low level WC, pedestal sink and panelled bath with mixer tap and attached shower head. Tiled flooring and part tiled walls. Double glazed uPVC window with patterned glass. Radiator, extractor fan and spotlights. Double bedroom with built a built in wardrobe and double glazed uPVC window overlooking the garden. Radiator and ceiling light. Large single bedroom with double glazed uPVC window . Radiator and ceiling light. Split into two sections, to one side the front garden is laid to lawn and the other a tarmac drive suitable for two cars. Side access to the rear garden. External lighting.